Caponatina is eggplant at its best. This finely chopped version of capponata is a delicious appetizer which can be serve on toasted crusty bread or even over a little pasta. It’s a traditional Sicilian eggplant appetizer which could also be served as a part of your antipasto table. The sweet and sour flavor of the sautéed eggplant mixed with the rich taste of olive oil and other vegetables will make a memorable appetizer for any occasion. 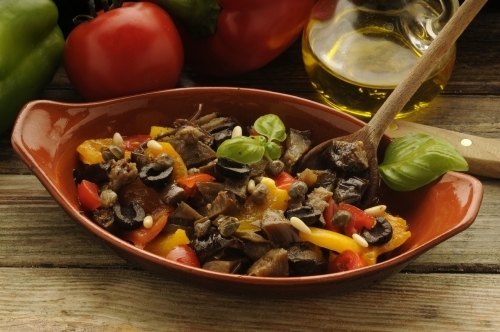 Making Caponatina is a great start to any great Italian meal. Serve it for a luncheon or at dinnertime. Prepare the eggplant by salting them and letting them stand around a half an hour or more to release the excess water. Rinse and pat dry with a paper towel. In a frying pan sauté the eggplant in olive oil until tender. Remove the eggplant from the pan and drain on a paper towel and set aside. Add the onions, celery and bell pepper to the pan and sauté until tender, about 3 minutes. Stir in tomato sauce, olives, capers, pine nuts and raisins and simmer for 15 minutes. In a separate saucepan slowly heat the vinegar and sugar until sugar is dissolved. Stir the sugar vinegar mixture into the tomato sauce . Serve warm or cool to room temperature before serving. Serve on toasted bread.